I received another strange ingredient recently thanks to our good friends Aaron and Alina, this time it was Pure Pistachio Oil. It's a wonderful, delicate oil with a decidedly green hue to it. Pistachio oil is not really meant to be cooked with- it's better to use this oil in fresh ingredient recipes; say a salad vinaigrette or a drizzle on a freshly grilled salmon. Or in cashew butter! I originally created this recipe because I was half way through a cookie recipe before I realized we were out of peanut butter. Yet another reason to lay out all your ingredients ahead of time... It worked perfect in the recipe and gave the cookies a subtle change over regular PB. 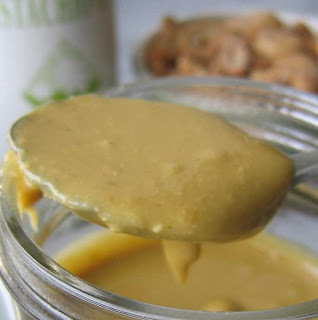 Use this cashew butter just like your normal shelf peanut butter- on toast or celery, or in recipes like cookies! It's healthy -in that good fat sort of way that nuts are healthy, plus it doesn't have all the preservatives and funny ingredients regular PB has. Try it out; it's fun, simple and tasty! 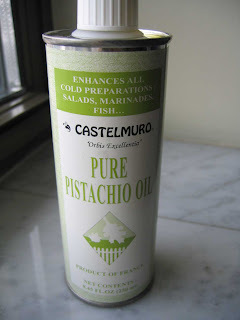 If you don't have Pistachio oil, I have made this with walnut oil as well. If you come across an ingredient you have not cooked with before- send it my way and let me create a recipe for you! Then we'll be fat and happy together! 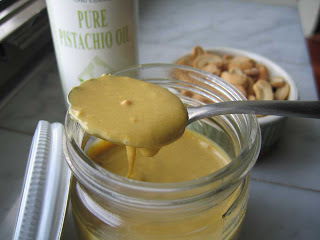 Place cashews, salt, sugar and 1 tbls of pistachio oil in a blender. Blend on high, you will need to stop the blender once in a while to push down the sides. The blending process is going to take 5-10 minutes. Add a few more drops of oil at a time if you need to thin it out; it is still going to be slightly runnier than a shelf peanut butter. Enjoy!